I’m looking forward to spending five days at the University of Georgia, where I am honored to serve as the history department’s fall semester Gregory Guest Lecturer. My presentation, “Dissent and Outrage Within the Confederacy: Community, Race and Kinship in the Civil War Era,” will be drawn from my new book, The Long Shadow of the Civil War: Southern Dissent and Its Legacies. 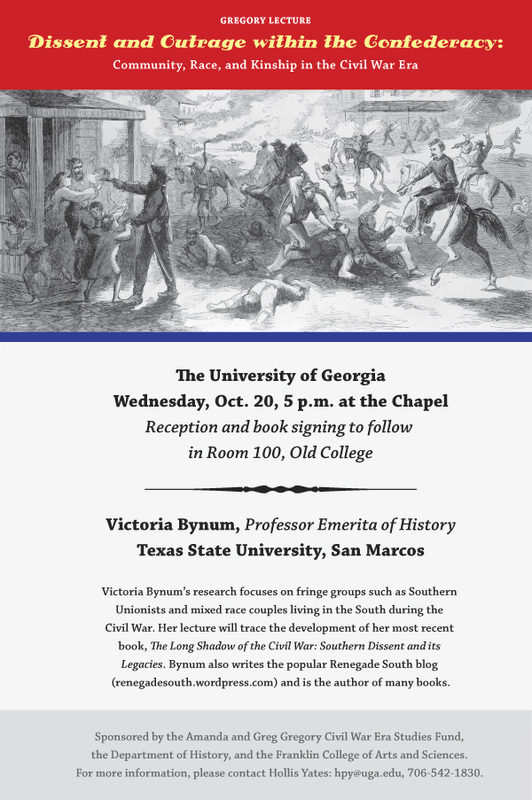 The lecture, scheduled for Wednesday, October 20, 2010, will begin at 5:00 pm in the University Chapel, followed at 6:15 pm with a booksigning and reception at Old College. The Gregory Guest lecture is part of the UGA history department’s War & Society Workshop, an interdisciplinary forum dedicated to the study of social, political, economic, and cultural aspects of war and its aftermath. In addition to its speaker series, programs include The Cobb Forum: UnCivil Wars, roundtable workshops, and various community outreach projects. Creation of the War & Society Workshop was aided by a support fund provided by Amanda and Greg Gregory, who have also provided a one million dollar endowment to the University of Georgia to establish a new chair in its history department devoted to the study and understanding of the Civil War Era. I am delighted to have the opportunity to participate in this outstanding program of study! To learn more about the Gregory Endowment and UGA’s War & Society Workshop, click here. Renegade South is on vacation.